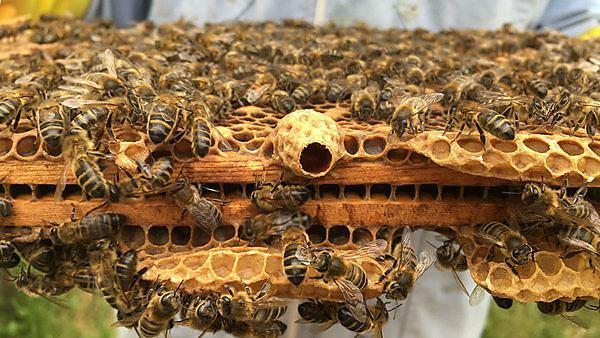 Plymouth University is marking National Honey Bee Day this week – and one of its leading academics hopes the event will underline the importance of sustaining bees and other pollinators. To coincide with the national day on 20 August, the University is holding a free, bee-themed ‘make and take’ event in its Drake’s Place Gardens tomorrow, 18 August. Dr Mick Hanley, Reader in Plant-Animal Interactions, said that with their numbers in decline globally due to habitat loss, pesticide use, and disease, the event will help to raise awareness of the many problems pollinators currently face. And he added that by building ‘bee hotels’ – the materials for which are provided at the event – as well as growing a wide variety of plants in the garden, everyone can ‘do their bit’ to help the cause. “The service provided by bees and other pollinators is worth more than £150 billion a year to the European economy alone, as the cross pollination of so many crop plants that provide us with fruit and vegetables is very costly or impossible to replace,” he said. “Many of our favourite wild flowers species are also entirely dependent on bees, flies and butterflies for reproduction. And yet it’s unfortunate that land-use changes in the UK in particular have seen 90 per cent of their natural flower habitat lost to agriculture since World War Two. There are also concerns that the use of new forms of pesticides (neonicotinoids) affects bees’ ability to learn and remember routes to and from food sources, with resulting negative impacts on their reproductive success. “Habitat preferences vary for each species, but we can help by using our gardens to offer structures for pollinators to nest and hibernate in and food plants to supply essential nectar, and pollen. “The most common species of bumblebee are generally less fussy about which plants they use in our gardens, but many specialist species – in particular, long-tongued bumblebees – prefer native plants such as foxglove, for which they have evolved a preference over millennia. We can help by growing these native European plant species in our flower borders as well as vegetables like beans, which bees love and which we can also eat. Plymouth University also keeps bees in an on-campus apiary, with the aim of developing a substantial and significant contribution to the University and wider community, as well as numerous academic research outputs over several years. The installation is in collaboration with the B4 project. Visit the Plymouth University Beekeeping Group webpage for further information. For more information about the bee-themed ‘make and take’ event, visit the Plymouth University events page.